Brighton & Hove Albion have named former Barcelona midfielder Oscar Garcia as their new head coach in the wake of Gus Poyet's dismissal. 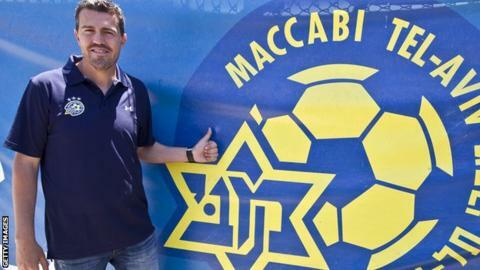 The 40-year-old Spaniard, who quit as Maccabi Tel Aviv manager last month, will take up his new post on Thursday. "I'm delighted to have the opportunity to work in English football for the first time," said Garcia. Playing career: Barcelona B, Barcelona, Albacete (loan), Valencia, Espanyol, Lleida. Coaching career: Catalonia (assistant), Barcelona (youth), Maccabi Tel Aviv (manager). Chairman Tony Bloom said Garcia would help Brighton prepare for the forthcoming Championship campaign. Brighton said the post of head coach was a newly created role. "We are delighted to have Oscar here to help us prepare for the new season and plan what promises to be another exciting campaign for the club," added Bloom. Former boss Poyet was sacked on Sunday, but the Uruguayan is set to appeal against the decision. Poyet received news of his dismissal on Sunday evening while working for BBC Sport on their Confederations Cup coverage, but the club insist the 45-year-old was "aware his dismissal was pending". Poyet, assistant Mauricio Taricco and coach Charlie Oatway were suspended last month pending an internal inquiry into alleged breaches of contract. Taricco had his ban lifted, but has left the club by mutual consent, while Oatway is still suspended. Meanwhile, Maccabi have announced that assistant boss Ruben Martinez and fitness coach Juan Torrijo Navaro have left to "continue their partnership with Oscar Garcia". Garcia played for Barcelona for six years and also coached the club's youth team before guiding Maccabi to the league title last season.